This year’s CES brought a ton of brand new high-end drones including the one we’ll be focusing on today. As the title suggests, we will be diving into Yuneec Typhoon H Plus to see whether or not it sports some real improvements over the original which came out back in 2016. As for the actual drone, it’s basically the same design just like Yuneec H520 but it’s designated to be much less expensive? Why is that so? Well, Yuneec Typhoon H Plus doesn’t come with a comprehensive software as the H520. Let me remind you – H520 comes with specialized software for industrial tasks such as 3D modeling, mapping, search and rescue, inspections and so on. As you could read above, the biggest upgrade the Plus version has got over the original Yuneec Typhoon H is the camera. In fact, the current CGO3+ camera was part of a previous upgrade that ended the run of CGO 4K. However, the current 12MPX CMOS sensor capable of recording 4K at 30fps just can’t cut it anymore, especially once you take a closer look at other similarly priced competitors. That’s why Yuneec Typhoon H Plus announces a brand new E90 integrated camera and 3-axis gimbal combination which we already had the chance to see with their industrial H520 model. We are talking about a mighty 1-inch CMOS sensor with 20 effective megapixels that’s sure to put an exclamation mark on all of your aerial footage. Another notable upgrade for Yuneec Typhoon H Plus is its completely revamped internal hardware. This includes not only the flight controller but motors and their respective ESCs as well. So, let’s take a closer look at the new Flight Controller board which aims to make a world of difference. 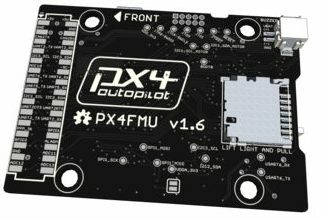 The newly implemented flight controller is Pixhawk Flight Management Unit. More precisely, the PX4 which has been specifically catered to the needs of Yuneec Typhoon H Plus. It brings forth improved power efficiency and, together with redesigned ESCs, allows for digital communication with all 6 motors. Talking about motors, there are several changes in this department too. First of all, these new motors seem slightly bigger and are equipped with propellers that have a more aggressive pitch allowing for more lifting power. Yuneec Typhoon H Plus is also roughly 40% quieter than the original, even though I never considered it to be an overly noisy hexacopter. Arms have been slightly extended too and the frame generally seems beefier than the original one. Last but not least, the battery life has remained roughly the same with minimal improvements thanks to new hardware that’s less power hungry than the original one. With this in mind, you can expect slight boosts in your operating time… but don’t expect anything above 26 or 27 minutes. One great thing about the original versions of Yuneec Typhoon H was the collaboration with Intel. As some of you already know, there were Typhoon H models that sported Intel RealSense technology and they were slightly more expensive than the standard packages. For those of you who don’t know what Intel RealSense is, here’s some useful information. 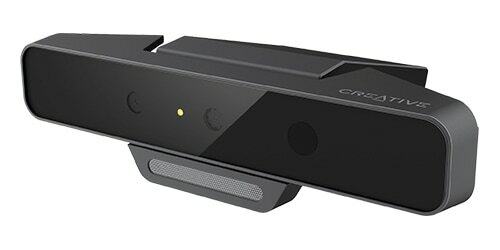 Intel RealSense is basically a highly sophisticated obstacle avoidance system that gets data not only from sensors but cameras as well. It basically allows the drone to see the space around itself in real time making sure it effectively avoids any obstacles that might get in its way, even if they are barely visible (such as nets, branches, and other similar things). Does a new ST16 transmitter mean longer operating range? As for the transmitter, Yuneec Typhoon H Plus comes with ST16 transmitter which is the same one as with the original… or is it? Nope – this here is the redesigned ST16 S transmitter featuring 16 channels and having a 7-inch LCD display. Actually, it’s an Android-powered tablet that is used to view live stream downlink in HD for up to 1.5 kilometers. This means that both operating and video transmission range are pretty much the same as the original since Yuneec still uses WiFi. Of course, this is not a budget cut but a method of staying compliant with countries which don’t allow their residents to buy drones flying over 7 kilometers. 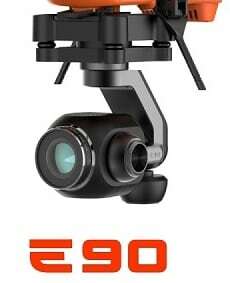 As it was already mentioned above, H520 and Yuneec H Plus are pretty much identical drones in terms of outer appearance. However, the former is more oriented towards fully-fledged industrial scenarios while H Plus is more catered towards aerial photography. 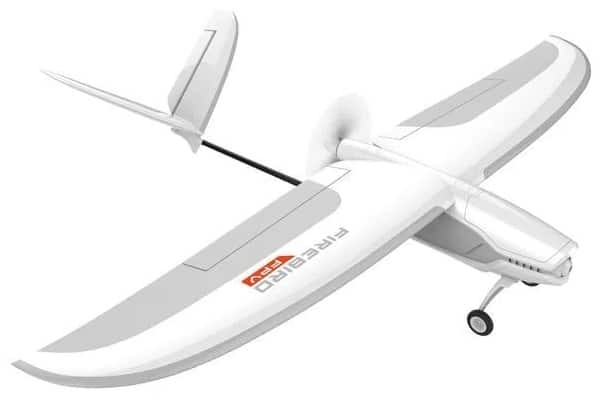 With that being said, the most notable features with this one are definitely its autonomous flight modes that allow for easy aerial footage recording. Mainly, I am referring to the same ones that are present with the original Typhoon H model – Journey and Orbit. These modes are a vital part of every premium grade aerial photography platform. In addition to that, it’s also praiseworthy to add that the provided 3-axis gimbal sports full 360 range of motion ensuring you get the optimal scenes for recordings. Altitude hold, GPS, and similar backbone features are here as well… but considering the price tag this bugger goes for, their presence is not really questionable. Now that you know a great deal of useful information about the all-new Yuneec Typhoon H Plus, the majority of you must be wondering about its price tag and release date. No worries guys, all info has been officially announced and you won’t have to wait a long time to get your hands on this baddie. 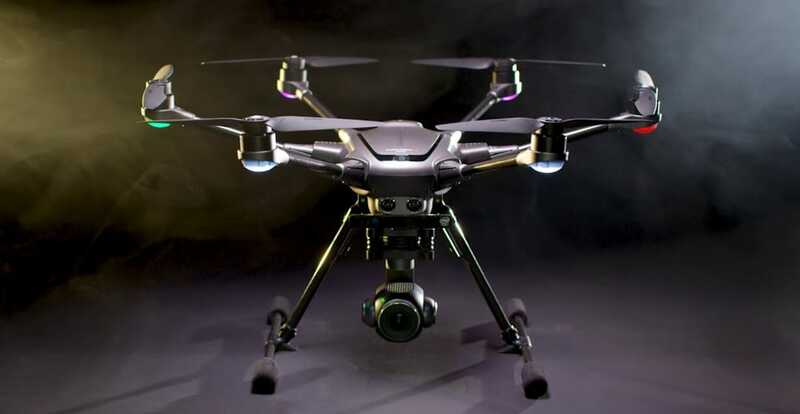 First things first, the standard version of Yuneec Typhoon H Plus will go for roughly $1500 while the version equipped with Intel RealSense technology will set you back for additional cca $300. However, the latter won’t just give you Intel RealSense but there have also been rumors about extra batteries. Still, at the time of writing this articles the extra batteries information remains a rumor. Firebird FPV is Yuneec’s official entrance to the world of fixed-wing aircraft. It looks absolutely dashing with its sleek white and gray finished coupled together with a sturdy frame. And don’t you think this is a toy grade fixed wing model! In fact, Yuneec made sure all such claims fall into the water by adding a 4K ready camera that records footage directly to the onboard SD card. Plus, the top speed goes all the way up to 83km/h which is freaking awesome! 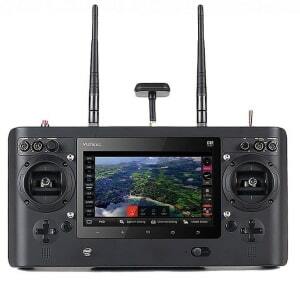 As its name suggests, Firebird FPV sports… well… FPV, meaning it will provide you with full immersion and make you think you’re flying a real airplane. When it comes to specifications, the exact operating range has not been announced just yet. Luckily, the battery has been! We are talking about a powerful 3S LiPo containing 2800mAh. Such a capacity is enough for around 30 minutes of flight time which is not bad for a fixed wing aircraft. Just like Firebird FPV is Yuneec’s entrance to fixed-wing aircraft, HD Racer is their entrance to the drone racing market. More precisely, to the beginners’ drone racing market. After all, we are talking about a brushed mini racer that doesn’t even come equipped with a 5.8Ghz vtx and camera setup. Instead, it opts for digital video downlink and sports a pretty solid HD camera. 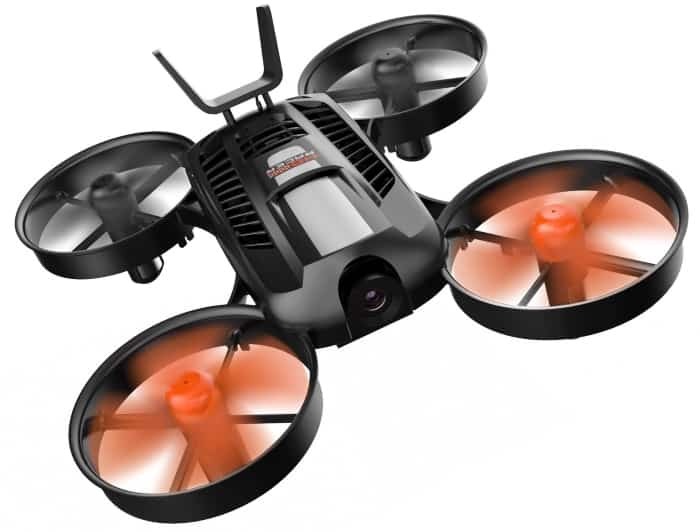 Of course, it is capable of recording your footage which you can later use to show off skillful flights to your friends. When it comes to its specifications, there is not a lot of things we know about it. For instance, operating range hasn’t even been announced yet and neither has been the flight duration. However, the price tag has been mentioned a few times and it will go for cca $170. After a huge pack of information regarding Yuneec Typhoon H Plus as well as some brief info surrounding other 2 Yuneec models announced on CES 2018, I am afraid we’ve reached the end of this article. It’s been an enjoyable ride for you, as it always is with news from CES and similar events. 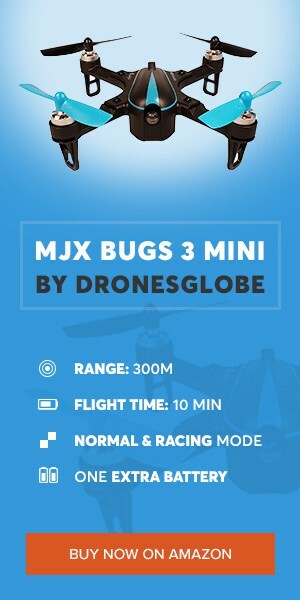 So, what do you guys think about these 3 awesome looking drones? Let us know in the comments section below! Autel Robotics EVO – Could This Be The Mavic Pro Killer We’ve All Been Waiting For? !